Inhabitants Lakitus, Bob-ombs, Toads, etc. Glitzville is a Chinese-style city built on an artificial floating island. 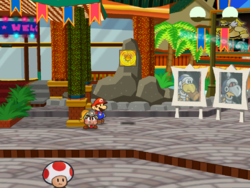 It is the setting of Chapter 3 in the game Paper Mario: The Thousand-Year Door. The city has a Hot Dog stand and Souvenir Shop on its left and a juice bar on the right, but the main attraction is the Glitz Pit in the middle. Glitzville is popular and gets visitors from all around the world, according to Goombella's Tattle ability. There is also a pay phone in the left of the foreground. It also has a hot dog cut out next to the Hot Dog stand. The in-game map description reads, "A floating city in the sky known for its exotic atmosphere. Warriors fight daily here in thrilling bouts that take place in the city's arena. It's rumored that the rich and famous bet on the fights here." To reach Glitzville, Mario must take a blimp shaped like an enormous Cheep Cheep. 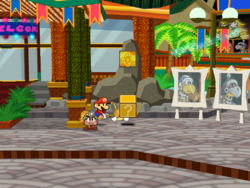 However, Mario needs a ticket to access the blimp, which can be gotten from Don Pianta for finding his daughter, Francesca Pianta. "Yup, this is Glitzville. It's so exotic; it feels like we're in another country! This is like an entertainment hub that attracts visitors from all over the world. The Glitz Pit is, obviously, the main attraction. That's where fighters duke it out. To the right: the Fresh Juice Shop. The Hot Dog Stand is to the left. Where to first?" Additional items are on sale at the Souvenir Shop, which is located in the western part of Glitzville. Hot Dog Can be bought from the hot dog shop from Mr. Hoggle for 10 coins each. Hot Sauce Given and purchasible from the Ratooey Businessman after finishing his trouble. Inn Coupon Behind the red poster to the front of the juice bar. Power Plus P In the chest box on the roof of the juice bar. Shine Sprite In Glitzville, it's in the right of the area near the Glitz Pit. There is a hidden block below to reach it. Star Piece In Glitzville, it's behind the telephone booth in the southwest. In Glitzville, it's in the far-left corner inside the juicy shop in the right. In Glitzville, it's behind the right plants before the entrance of Glitz Pit. In Glitzville, it's under a panel in the middle-south. On top of the juice shop, it's under the Rawk Hawk poster. Requires Tube Mario or Koops. Storage Key Behind the telephone booth during one of X's missions. Behind the left Gonzales poster on the second floor in the lobby during another of X's missions. Super Hammer In the juice shop, it's given by Podler in Chapter 3. 1 Coin Outside, near the front-right pillar of the Glitz Pit's entrance is a Shine Sprite. There's a hidden ? Block underneath it that Mario can reveal by hitting it with his Hammer. French Yunnanville Fusion of Yunnan (a Chinese province) and "ville" (French translation of "city"). Italian Oolong Just as the Japanese name. In Japan, Glitzville is known as Ūron Machi, which translates to Oolong Town (Oolong is a variety of Chinese tea). 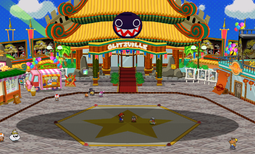 The "Oolong Town" moniker actually survived on the Glitz Pit building's label on the official Paper Mario: The Thousand-Year Door website, although it was correctly referred to as "Glitzville" everywhere else. When the camera pans across Glitzville at the start of Chapter 3, a poster of a Cleft can be seen behind the Hot Dog Stand, while no normal Clefts appear anywhere in Glitzville. When boarding the blimp, the sign that says "Glitzville" changes to "Glowtown", a synonym of Glitzville and most likely an error. This page was last edited on April 22, 2019, at 09:43.